HAWTHORN has sent retiring champion Luke Hodge out on a winning note, ending the Western Bulldogs season and Robert Murphy's career with a nine-point win at Etihad Stadium on Friday night. In an emotional night that also saw heart-and-soul Bulldog Matthew Boyd retire, the 2016 premiers were unable to fire one last shot in a disappointing season as the Hawks held on to win 15.9 (99) to 13.12 (90). With little on the line the match became a celebration of three great careers, and Hodge, Murphy and Boyd were carried from the stadium side by side through a guard of honour as tears flowed. 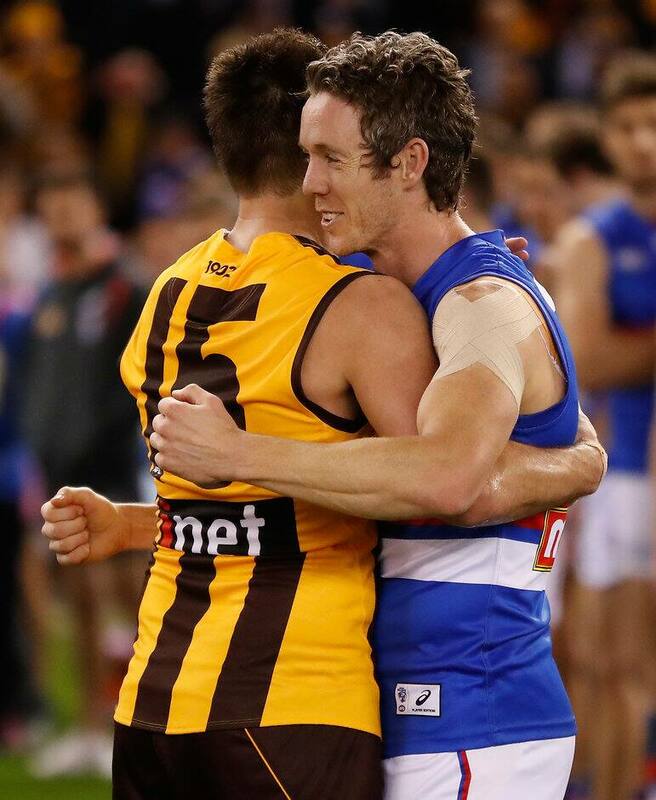 But when the emotion washes over, the Bulldogs will be left asking how their premiership defence went so wrong as they become the first team since the Hawks in 2009 to miss the finals the year after their flag. Their shortcomings in 2017 were encapsulated on Friday night, with the Hawks winning the tackle count 73-46 and playing with more purpose, despite the Bulldogs being the only team with finals on the line. Hawthorn captain Jarryd Roughead was the star, booting five goals, while Tom Mitchell finished his record-breaking season with 32 possessions in a dominant midfield that won the clearances 46-23. While they celebrated the past, the future was also on show for the Hawks as Jaeger O'Meara produced a performance the club will hope can be a springboard into a healthy and productive 2018. He finished with 25 possessions and five clearances in his 50th game, laying a massive 11 tackles and playing in his first win since round 19, 2014. The other positive for the victors was the form of hard-running youngster Harry Morrison, who racked up 21 possessions in an impressive debut. But for Hawthorn the night was all about one of the club's all time greats, and Hodge proved he was finishing with fuel in the tank. He played his customary general role at half-back, barking instructions to the end and putting himself where he was needed most. As the Bulldogs surged in the final minutes he interjected with a crucial spoil, and was able to finish the match with the crowd of 48,090 chanting his name. The final twist: Where will your club finish in 2017? "I've had a ball and the way we finished off was great," Hodge said after the match in an interview with 2001 'superdraft' contemporaries Chris Judd and Luke Ball. Coach Alastair Clarkson paid tribute to the retiring class, which included injured premiership defender Josh Gibson who walked a lap of Etihad Stadium at half-time to farewell Hawthorn fans. "It's a pity there had to be a winner and a loser out of those two sides," Clarkson said. "We're pleased for 'Hodgey' and 'Gibbo' that we were able to get the win to make it a nice finish to his career. "But it was a really fitting finale, the gathering of both clubs' supporters staying after the game to see those three guys chaired off the ground. "There's some special moments in footy and that was one of them." While the night built to a memorable finish, it started with a whimper as both teams eased their way into an uncontested match that lacked any intensity. Despite the slim possibility they could qualify for finals with a win, the Bulldogs were not lifting for the occasion and laid just 10 tackles in the opening term as the Hawks built a seven-point lead. Coach Luke Beveridge appeared to be in experiment mode, lining up for centre bounces without wingmen and starting two loose players in defence. A jumper punch from Blake Hardwick on Bulldogs star Marcus Bontempelli set off a scuffle halfway through the second term, breathing some life into the clash, but it wasn't enough to sustain the disappointing Dogs. They finished the match with 10 more forward entries (50-40) but were unable to capitalise, watching on as the ball repeatedly bounced back out of their forward line. Boyd was the best of the retiring class, finishing with 33 possessions, 12 marks and a goal in his last game. The Bulldogs were also well served by Jack Macrae (33 and six inside 50s) and Liam Picken (three goals), with Toby McLean (26 and six tackles) also working hard all night. But, like their season, they just couldn't get their game going for sustained periods and never looked convincing, finishing the season with more questions than answers. "We probably made the easy look hard at times, didn't we?" Beveridge said after the match. "We just haven't got anyone down there to take a mark, whereas they got us on some of our blatant turnovers and I think that's the game right there. "It's another example of what we don't want, absolutely." Hawthorn: The Hawks finished the season without any injuries. Western Bulldogs: Ruckman Jordan Roughead was forced from the ground with a cut head during the second quarter and sent to the rooms, but he was able to return and play out the match.